Aiden Collins, an eighth grader at the Dover-Sherborn Middle School, has strummed new life into the school’s music program by hand making five electric basses for the school’s general music program taught by Tom Duprey. Duprey isn’t directing your ordinary middle school jazz band: there are no rows of folding chairs or black aluminum music stands, and the kids aren’t fidgeting at attention until their cue comes. Rather than channeling the big bands of Glenn Miller and Benny Goodman, Duprey teaches his students to make music in a form they recognize: through rock bands. With a classic, two-guitar-bass-and-drum format, the middle school students learn the essentials of blues progressions through rock and roll staples like “Hound Dog” and “Twist and Shout,” then write their own songs to perform at the end of the term. The program has been developing for about eight years now – keyboards were added to the mix of six string guitars, and improvised percussion pieces were replaced with electric drum kits. But one crucial item remained glaringly missing: bass guitars. A day after Aiden gave the instrument to Pine Hill, Duprey was reaching out to him with a plan. 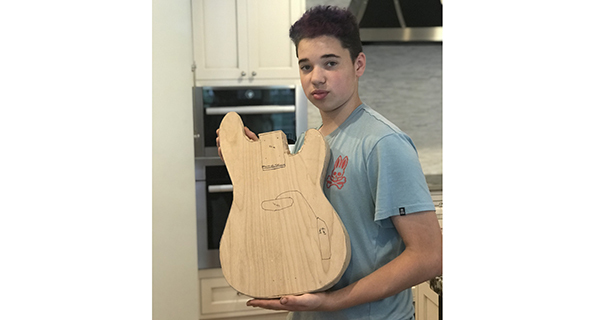 With money fronted by the middle school, Aiden found a bass building kit on a DIY instrument website, ordered five, and set up shop in the family garage. It was summertime then, so with the family cars parked outside and all the time in the world, Aiden got to work. 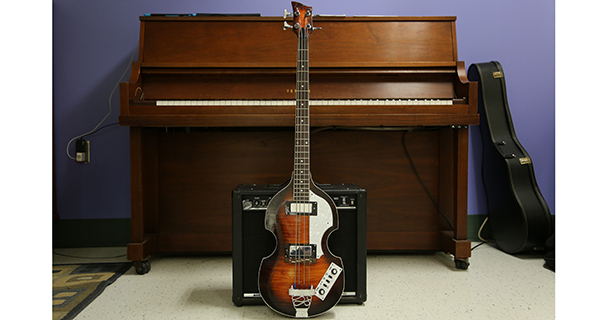 Modelled after a Hofner bass (the kind Paul McCartney played when he first showed up on the Ed Sullivan Show stage), the basses' semi-hollow violin shaped bodies, complete with all the pickups, knobs and switches of an authentic Hofner, have been irresistible to the middle school students. The world’s greatest bass players are known for having enigmatic personalities, and Aiden bears the hallmarks of being a bassist to his soul. Though modest and unassuming when you first shake his hand, Aiden’s choice to wear an electric-blue shirt, seemingly adorned with sunglasses-clad flamingoes, to his middle school winter concert was a quiet, yet telling sign of the wit teeming beneath the surface. Once he was talking about music and basses, though, this wit, and his enthusiasm, passion, and expertise, began to rise rapidly to the surface and pour complexly out of him. Looking to his parents for a bit of help, Aiden calculated that he’s built at least ten basses since he started, though as he tends to borrow and reuse parts from all of them, his quiver sits in various states of working and hobbled order. Once, too impatient or too excited to get to work on a project, he hand-cut a perfectly rendered Telecaster bass from a hunk of raw alder wood. Take a look at the photos accompanying this article; Aiden is good at his work, and it’s evident.